How Can Reiki Serve Me? Reiki can be used simply as a form of relaxation, or we can focus on a specific physical or mental/emotional challenge you are having. As an option, I love introducing creativity into my sessions to identify the source of energy blocks, stress or pain. This can look different ways, depending on the client's needs, such as using practices like drumming and other sounds, stones and objects from nature, and my and the client's imagination. It is a process that can, if the client wishes, allow for collaboration. I also offer customized Maternity Reiki sessions and trainings for families throughout pregnancy, delivery and post-delivery. Our bodies, minds, hearts and spirits are designed to seek and maintain balance, a state we call "health." You are your own healer. As a Reiki practitioner, I co-create with you a powerful space for healing to unfold within you, a strong container within which the stresses and distractions of life are released so that your system can sink into the flow of healing. This experience can bring a profound sense of calm, release, renewal and spontaneous insight. As an energy art that grew from the intersection of Japanese Buddhism, Japanese martial arts, and indigenous Shintoism, the practice of Reiki helps to align our body, mind, heart and spirit and to sweep away that which stands in the way of knowing and expressing our true, whole selves. Reiki sessions can be conducted in person at my studio, or remotely through distance sessions*. Reiki is complimentary to other forms of medical or healing work, and can support physical, mental and spiritual health. Reiki encourages a person's body and spirit to release anything that no longer serves, and that's ready to release. Just as pouring cool water through a dusty pipe washes away loose dust and debris, Reiki washes through a person's system and loosens up pain, negative emotions and energy blocks, re-energizing the system. At it's heart, Reiki is most powerful as a self-practice. To bring this healing art into your own spiritual or wellness practice, join me for a Reiki training, offered regularly in Davis and Sacramento. 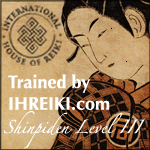 I am a Registered Practitioner & Teacher of Shibumi International Reiki Association, dedicated to supporting those who practice and teach from a Japanese perspective. Shibumi standards and codes hold members to a high degree of quality and dedication, and help define what it means to practice from a Japanese perspective.